Discopop Directory: New Prince: What If? Pint-sized pop polyglot Prince has premiered a new song, shortly after announcing that his Hit and Run tour is coming to America. What If is a cover of a plodding AOR ballad by contemporary Christian songwriter Nichole Nordeman. 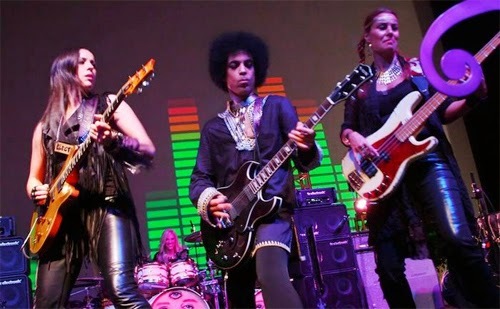 Prince, of course, lights a firecracker under its arse and turns it into a ridiculous rock opera full of frantic soloing, while he trades lines with 3rdEyeGirl drummer Hannah Welton. Their back-and-forth elevates the song's lyric - a theological debate about the existence of Jesus - turning a sermon into a spirited argument between a believer and a doubter. "What if you're right and he was just another nice guy?" asks Prince, prompting Welton's reply: "But what if you're wrong? What if there's more?"